The sailing begins in Bergen. There are not many vital cities that have so well preserved historical buildings as Bergen. Bergen is also called "The City between the 7 Mountains" and is the entrance to the Norwegian fjords. Here starts and ends the traditional shipping routes over the North Sea. We sail from Bergen to the north in the evening. This is the day of spectacular experiences! Before breakfast you can see the Hornelen mountain, which is a part of viking stories. Ålesund is the perfect example of an Art Nouveau town. Ålesund burned down in 1904 and was rebuilt in Art Nouveau style. In the middle of the city lies the mountain Aksla, there are 418 steps from the center. In summer from June to August we visit the scenic Geirangerfjord, which is a part of UNESCO's World Heritage List. You will see high mountain peaks, steep mountains and wild waterfalls. In the fall from September to October we visit Hjørundfjord. Only Hurtigruten will visit this fjord. It is a small fjord pearl surrounded by small villages mountains and untouched nature. You can join in on excursions for instance go on a hike to up the mountain where you get the most amazing views. Choose your excursions for day 2 here (Purchase). Trondheim is the capital of central Norway, founded by the Viking king Olav Tryggvason in 997. The city is the third largest and the city is still the main goal of many pilgrims. Please don’t miss visiting the magnificent Nidaros Cathedral. Nidarosdomen is actually Norway's most famous church. At the same time it is also the only church built in Gothic style. Visit the old town of Bakklandet, with well-preserved and old-colored wooden houses, before sailing on to the polar circle (midnight sun's kingdom). When we depart from Trondheim on Trondheimsfjorden we can see the small island of Munkholmen on the way. The historic island has served as a place of court, monastery, fortress and prison. Choose your excursions for Day 3 here (Purchase). We cross the invisible border - the polar circle! We are now 66o 33 'North. It is the southernmost point where the sunshine of the midnight shines 24 hours, and the northern lights illuminate the winter sky. On board we celebrate the crossing on the deck. It is the first day on the Arctic waters, and we arrive to Svolvær during the evening. Svolvær is also known as one of the islands on Lofoten. Lofoten is the city in which you fall in love. Lofoten have raw granite and volcanic rocks, mountains with small fishing villages hidden in between and white sandy beaches. Several small places like Henningsvær or Stamsund have the classic fishing stands, and small traditional fishing villages. Select your excursions for day 4 here (Purchase). During the night we sail through the narrow Raftsundet. Hurtigruten dock at Risøyhamn and Harstad before the trip continues via Finnsnes to Tromsø, where we have a longer stop. Tromsø is the Arctic capital and it is a beautiful city with a vibrant cultural life. The town is surrounded by mountains, fjords and islands, and with its famous landmark Ishav Cathedral, worth a visit. In winter you can complete your stay in Tromsø with a thrilling husky dog sledge ride. Select your excursions for day 5 here (Purchase). 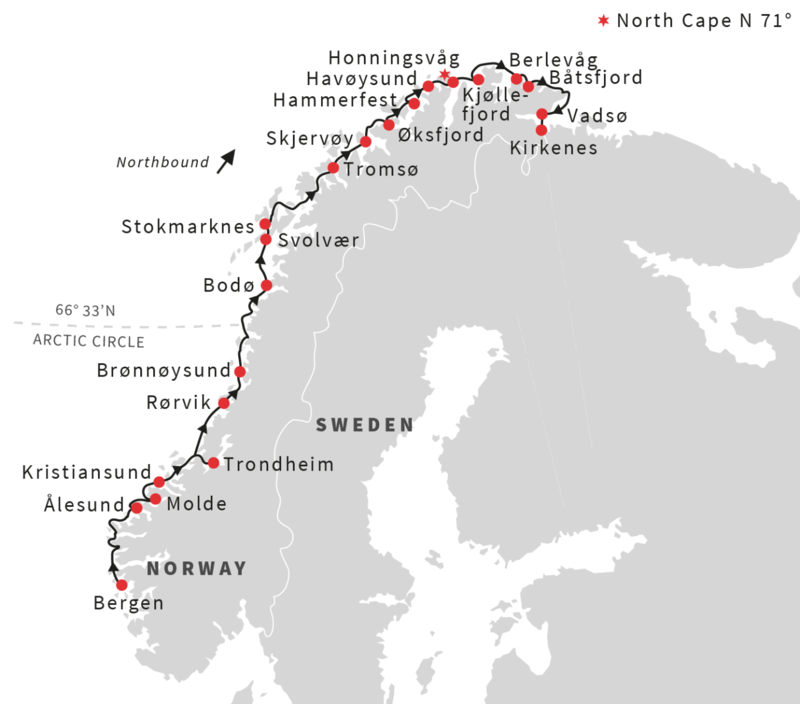 Today will visit Honningsvåg also known as the entrance to Nordkap which is the northernmost point on European mainland. If you wish to go to the northmost point then join our excursion or join a bird-watching safari to experience Finnmarkens largets flock of puffins. Afterward we sail through Lapland – the heatland of the indigenous Sámi people. We pass the rock formation Finnkirka and the fishing village of Køllefjord, where it is possible to meet the locals. The view and the sea become more dramatic as we sail towards Kirkenes. Kirkenes is only a few kilometers from the Russian border and the Sami communities in northern Scandinavia. Kirkenes is known as the capital of the Barents region and the harbor to the east. The summer is amazing in Kirkenes with up to 30 degrees of heat and the locals speak Norwegian, Sami, Finnish and Russian, which also reflects the culture of Lapland. On the trip south, along the Norwegian coast, we now visit the ports we visited during the night on our way to the north of the day. We arrive at 9am and we will now have a lot of memories of the world's most beautiful voyage where you have now visited 34 ports. If you wish to stay at a hotel before going home it is also possible to ad in some of the optional excursions. Ships are sailing every day all year around, so if you need specific prices please send us an email or call. Prices are for two persons staying in an inside basic cabin. All prices are fluent which means that they vary from season to season and month to month, as well as the date of departure and availability on board the ships are fluent. The lowest prices are sold first. Full board (breakfast, lunch and dinner) is always included on the classical voyages along Norwegian coastline. You can arrange transport to/from Norway from when you have received the invoice with confirmation.